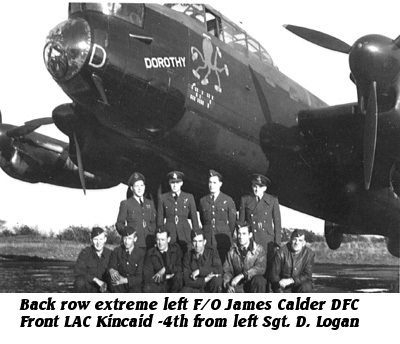 Montreal born, and former Royal Canadian Artillery member Calder enlisted with the RCAF on December 12th 1941. Graduating from No. 5 ITS in July of 1942. He then went on No.13 EFTS until completion of the courses in October of 1942. By March of 1943 he had completed training at No.16 SFTS. His commission was received in 1942. With the completion of his crews training at No. 1664 CU, they were posted to 419 squadron on April 17 ,1944. On the night of April 20/21 he completed his 2nd. Dickie operation and he his crew were ready to get involved in squadron operational missions. It would not be until May 10th before their first operation for the squadron. Flying their next 10 sorties in support of the Allied advances after "D-Day". On the eleventh operation , they had an electrical short and fire in the bomb release distributor. This Failure left them with a 1,000 pound bomb hung up in the racks. With the fire extinguished by F/O Bernardi they worked successfully at getting the large bomb to drop. Calder and his crew continued operations over France, Germany and Against V1 rocket launch sites right up to October 6th of 1944. From July 20th up to including the final operation together in October the crew flew almost exclusively in VR- D "Dorothy" a veteran of 60 plus operations with 419 squadron. By the end of November F/O Calder DFC was posted to "R" Depot for repatriation to home. Also in that month his DFC went into effect from actions against V1 sites while the aircraft was without an electrical system. F/E P/O King was posted to No.1664 for instructional duties, and F/S Collette and F/S Montgomery were also posted to "R" Depot.